Secure Data Recovery Services provides professional digital media repair and recovery to Los Angeles through a local office on Melrose Avenue. We started our company in Los Angeles County, and by offering consistent recovery rates and excellent data security, our business has grown from a single facility to an expansive network of offices spread across the country. Should Los Angeles-area insurers, like Health Net, experience customer database intrusion, our computer forensics services can find root causes and assess damage. A local scientific company, such as Amgen, could benefit from our e-discovery service in civil product lawsuits. We offer outstanding digital forensics capabilities. Our certified mobile forensics and first responder skills can assist local law enforcement agencies, like the LA County Sherriff, if local resources are overwhelmed. We also offer expert testimony services. Because every data loss scenario is unique, we provide expert recovery services for all devices and any type of damage. Our engineers are certified for all major brands and media, and we offer custom turnaround times designed to fit your budget. Like all of our locations, our Los Angeles office is fully accredited with the Better Business Bureau. Our A+ rating with the BBB reflects a high level of compliance with their demanding standards. You can view the complete history of our A+ Rating and accreditation with the BBB of Los Angeles, including full documentation. Secure Data Recovery Services' engineers can treat most cases within a few days, and our 96 percent success rate is the highest in the Los Angeles area. However, your chances of a successful, affordable recovery depend on whether your device has extensive media damage or overwritten data for which you need data recovery. Los Angeles individuals and companies who trust us are more likely to recover their data than if they seek professional data services elsewhere. Immediately disconnect power to your device by unplugging it or by using its power switch. Do not shut down hard drives, flash drives, and other devices normally, as this may overwrite data and make it more difficult to conduct a successful hard drive repair. Clients who follow this advice greatly increase their odds of successful data retrieval. Do not run data recovery software: Commercial programs can damage your device if used improperly or if your media has physical damage. Contact Secure Data Recovery Services: Our certified Los Angeles data recovery experts can provide a risk-free media evaluation, providing you with a price quote, turnaround estimate, and list of recoverable files. If you accept our quote, we can start treating your case right away. 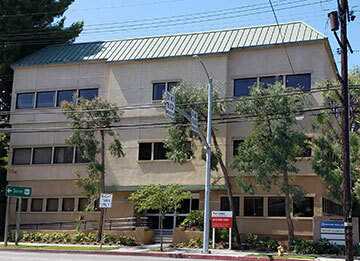 We offer local pick-up and drop-off services for our 24/7/365 emergency data recovery clients and encourage all of our customers to visit our Los Angeles facility for fast, responsive service. Once they receive our professional data recovery services, Los Angeles clients come back to us again and again for superior service. When you need data recovery, you should trust only a qualified, experienced provider with state-of-the-art equipment and experienced engineers. Secure Data Recovery Services operates Los Angeles' best facilities for hard drive data recovery, data tape repair, RAID recovery, and other media services. We specialize in Hard Drive Data Recovery utilizing the latest data recovery technology. Whether you need to minimize turnaround time or stay within a strict budget for hard drive recovery, Los Angeles clients enjoy a flexible set of options to help them meet their goals. Our 24/7/365 emergency service is the fastest way to get your business' data back up and running. Regardless of service level, we treat all damaged drives in a certified Class 10 ISO 4 Cleanroom to maintain high recovery rates and fast turnarounds for hard drive data recovery. Our Los Angeles clients can be confident that their data will be treated with the utmost security in person and online because of our secure facilities. Our RAID services are absolutely unparalleled. We maintain a large inventory of RAID controller cards, hard drive components, and other hardware to maintain excellent case efficiency. Our engineers can recover data from larger RAID systems in a matter of days, and we also offer RAID repair to help you minimize down time and related costs when you trust us for Los Angeles hard drive recovery. All data recovery providers need to take appropriate measures to protect damaged media and to maintain client confidentiality. Secure Data Recovery Services has more certifications than any other provider in Los Angeles County, and we regularly perform audits and laboratory tests in order to hold our facilities to the highest possible standards for data recovery. Our Los Angeles clients will not find a better provider, and you'll even get a free quote for our services when you contact us. Time is always an important factor in the data repair process. If you need hard drive data recovery or any other media-related service, our engineering teams are ready to provide fast, reliable service. To set up a new case, contact Secure Data Recovery Services today. As the United States' second-largest city, Los Angeles is the cultural hub of California and the state's largest metropolitan economy. Our local office provides easy access for the city's 3.79 million residents when they need data recovery. Our Los Angeles clients can trust the certified Class 10 ISO 4 Cleanroom, numerous security credentials, and the best engineering team in Southern California to provide a secure and fast way to get your data back after any media disaster. Whether you need to recover deleted files or repair a damaged hard drive, we have the technology and expertise to provide fast help. We offer transparent information about our services, and our Los Angeles facility provides risk-free evaluations for standard data recovery services. Call our customer service team today to set up an evaluation or for detailed information on any of our services involving hard drive recovery. Our Los Angeles associates are standing by to help you with our certified services. The Secure Data Team recovered my information off of a failed hard drive. Fred was especially helpful and if I ever had questions he consistently replied back right away. I am very thankful for the hard work and diligent effort of the staff at Secure Data who helped me get my information back. Thank you Secure Data and Fred! Chris was consistent with checking in during the hard drive data recovery process and was warm and understanding during phone calls. Thanks to Chris, our research group will come back to SecureData in the future for all our data recovery needs. Chris McMacken was able to help retrieve critical business data quickly and efficiently. Chris always called me with updates and quickly responded when I had to reach him. I will be sure to go to him again with any data retrievals in the future. Chris McMacken was quick to reply to my plea for help. He has been very helpful and informative throughout the whole process. My external hard drive was damaged when we had to evacuate due to the Woolsey fires. Unfortunately, my data was not recoverable but Chris kept me apprised of every step. Thank you, Chis for all of your wonderful help! Chris was great every step of the way In getting my data back to me. I appreciated his promptness and candor from the get go. Thanks again!